Highly professional staff, an interesting selection of tours. InsightCuba took care of everything so we could enjoy our experience and get what we wanted from it. 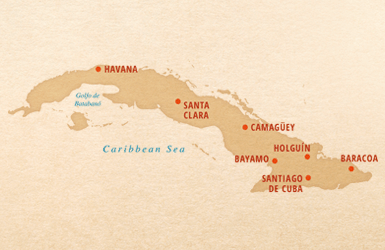 The intriguing island nation of Cuba is roughly 780 miles long. It’s a rich, geographically disparate stretch where virgin forests hug rustling tobacco fields, colonial cities sprout from the foot of rugged mountains, and rivers reach blue tentacles around fertile valleys. We wouldn’t blame you if you wanted to see it all. In fact, that’s exactly why we created the 12-day Undiscovered Cuba Tour. For those of you with a desire to leave no stone unturned, this is the ultimate tour. From the moment you touch ground in Havana, your Cuban guide is here to not only help navigate country roads and labyrinth streets, but to offer a unique perspective and understanding of the place they call home. After clearing immigration and customs at the José Martí International Airport in Havana, you’ll take a short drive to the Meliá Cohiba hotel for check-in and a tour orientation*. This evening, we’ll celebrate your arrival over a welcome dinner. Begin the day with a visit to a cigar factory. Then we'll journey through Old Havana's labyrinth cobblestone streets for a walking tour of the old city. Along the way we'll meet the creative minds at the National Union of Writers and Artists of Cuba (UNEAC) to learn about social, political and economic challenges Cuba faces today. After lunch, we'll continue our walking tour of Havana Vieja before returning to the hotel. Tonight, we'll dine at a popular paladar, a private, family-owned restaurant. This morning, we'll visit a farmer's market and experience firsthand how Cubans shop daily for groceries and the unique challenges they face. Then we'll meet with artists at the inspiring Muraleando Community Art project. After lunch, we’ll join in a discussion with leaders in Cuba's film industry and take a tour of the film institute. We'll finish off the day with a visit to Ernest Hemingway's famed home, Finca Vigia, in the seaside town of Cojimar. Tonight, you’ll dine on your own at one of many recommended paladares. Today, we'll journey to the colonial town of Santa Clara, where we'll meet with a specialist at a community children's project at a local art gallery. After lunch, we'll visit with with members of a traditional music troupe and listen to a performance. The troupe will demonstrate their unique style of music, common in theatrical performances and silent movies at the beginning of the 20th century. Then we'll visit the Che Guevara memorial and museum before checking in to our hotel in Santa Clara. After breakfast, we’ll depart for Camagüey, and have lunch in the beautifully restored square, Plaza de Carmen. Afterwards, we'll meet with a sculptor and painter in her studio. In keeping with the day’s artistic theme, we'll visit a local art school. We'll end the day with an interesting visit to a polyclinic to learn about socialized medicine and medical practices in Cuba. Tonight, you'll dine at a local paladar. During our second day in Camagüey, we'll visit an inspiring community project for children. Then, meet creative minds at Camagüey's National Union of Writers and Artists of Cuba (UNEAC). After lunch at a paladar, we'll meet with the dancers of a local ballet company. We'll dine tonight at the hotel. After breakfast, we'll make our way to Santiago de Cuba by way of Bayamo and other picturesque points of interest in between. After stopping for lunch in Bayamo, we'll meet with the members of the Choir of Bayamo and be treated to a special performance. Continuing our journey toward Santiago de Cuba, we'll stop at Cuba’s most important church, La Caridad del Cobre, frequented by the Pope on visits to Cuba. After arriving in Santiago de Cuba, will dine at the favorite Meliá Santiago hotel restaurant. This morning, we'll meet with local musicians to learn about the unique rhythms of Santiago de Cuba and have a dance lesson. After, we'll take a 20-minute boat ride to the lovely Cayo Granma, where we'll also dine for lunch. After visiting El Morro de Castillo, the historic colonial Spanish fort, and taking in the magnificent views, we'll explore the old town of Santiago de Cuba. Enjoy the evening and dinner on your own tonight in Santiago de Cuba. The day begins with a drive along one of Cuba's most scenic highways and through the lovely town of Guantanamo (not the prison) on our way to one of Cuba's most unique city's, Baracoa. We'll stop for lunch along the way. Your first morning in Baracoa will include a visit and tour of the quaint town center to familiarize yourself with your surroundings. Next, we'll visit the Matachin Fort Museum, rich in the history of Baracoa's fortification. After a short boat ride, we'll stop for lunch at Rancho Toa. After lunch, we'll visit the Fabrica de Cucuruchos, where sweets from palm leaves, coconut, sugar, and pineapple are handmade. Tonight, dine on your own at a paladar. After breakfast, we'll meet with Grupo Nengón Kiribá, a traditional Baracoan music and dance ensemble, for a performance and discussion. After lunch, we'll head back to Santiago de Cuba, where we'll have a farewell dinner. Santiago de Cuba / Holguín ¡Adios Cuba! After breakfast, depart for Holguín and visit an artist community, where we’ll meet local painters. Then, bid farewell to Cuba as you board your flight from Holguín’s Frank País Airport back home. *Transfers available for group blocks or recommended flight arrival and departure times. **Customary end-of-tour gratuities for the Cuban guide, driver, and tour leader are left to the guest’s discretion and should be based on your satisfaction with the level of service received. Once you have booked your tour, our flight concierge team will gladly assist you with all your flight needs. Call us at 914-380-8303 or click here for an air quote. Please note that domestic and international flight costs are not included in your tour or travel package. Flight times may vary, please consult the airline's website for the most up to date flight information fon your dates of travel. If you wish, you are welcome to purchase the above recommended flight on your own, however due to two to three-hour transfer times from Santiago de Cuba to the airport in Holguin, we advise ONLY using the recommended flights to ensure you receive a group transfer. Authorized airlines - Not all airlines are authorized by the U.S. Department of Transportation to fly to and from Cuba. While this information may change, the currently authorized airlines are: American Airlines, Delta Air Lines, JetBlue Airways, Southwest Airlines, and United Airlines. Please contact the carrier for up to date flight schedules and routes. Correct Airport - Please note that flights for this tour arrive in one destination in Cuba and depart from another. If you purchase air on your own, please make sure to book the proper airport or destination. Booking the wrong airport can result in expensive ticket change fees, or airport transfer.